I know you guys are chomping at the bit to see what's going on in the kitchen, right? I was hoping that by skipping last week's update I might have more to show you. 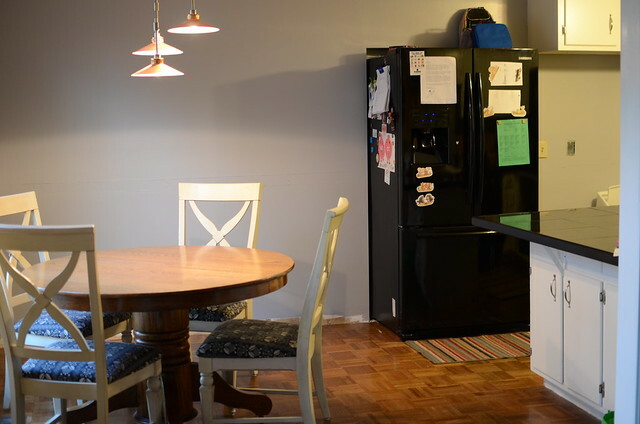 We decided on a color for the kitchen, which I like sometimes and sometimes it takes on this lovely purplish hue. So there is still a possibility that it will get repainted. Mitch painted a good portion of the kitchen along with the recess for the fridge. Then he moved the fridge into it's new home. It is strange how different the kitchen feels with this small change. Of course, this means that we have once again changed our mind on the layout of the kitchen. Now we are thinking about putting in a wall oven next the fridge and having cabinets above and underneath. 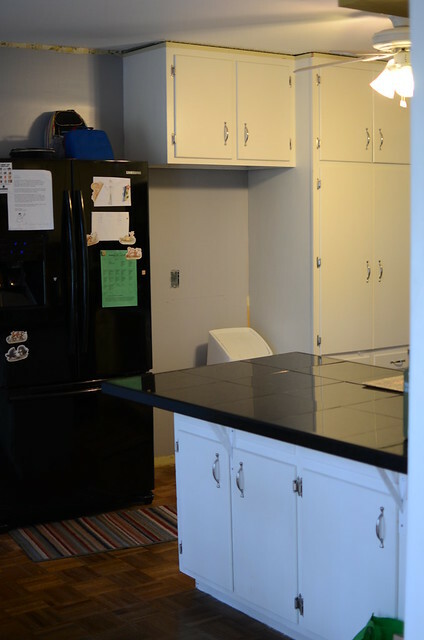 Then putting cabinets and countertop on the other side of the fridge. That way we don't have to move the pantry and the oven would be easier to access. What do you think? 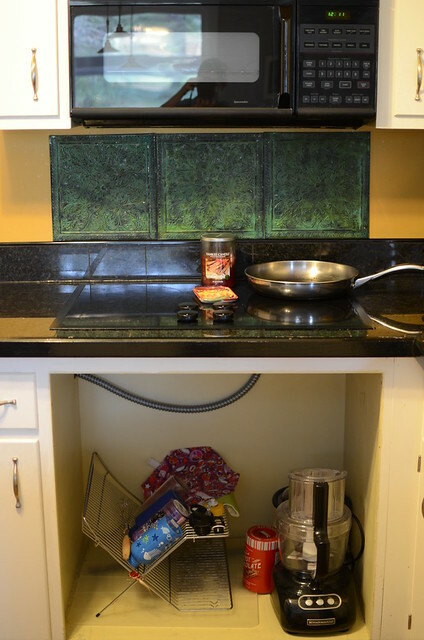 We would use the space under the range for more cabinets. As you can see I have been taking advantage of the free space. 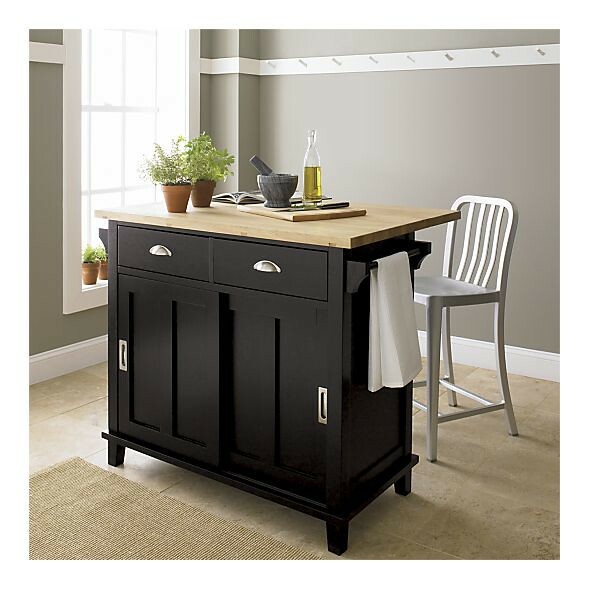 If we did this, there is no way that there will be room for a table and chairs, but we would have room for a small island with a couple of bar stools. This is what I have in mind. I like that paint color too. Then we would need to figure out where we would eat our meals. We have a couple of different options. Mitch talked to our contractor and he isn't available until the end of January. 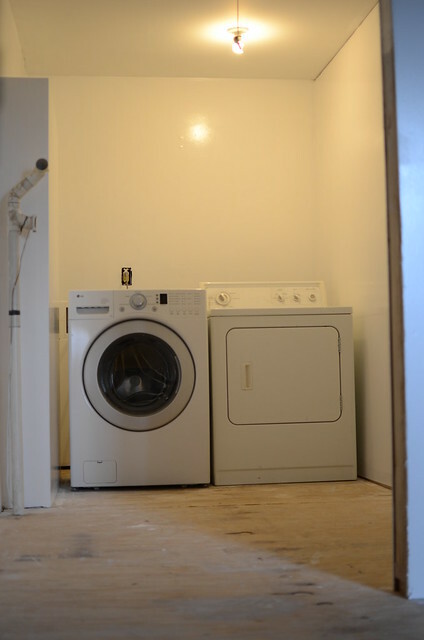 Mitch has been working on the laundry room and with the holidays we have not been too worried about it. We have an electrician coming on Friday to do all of the electrical work. So once Mitch finishes the laundry room, we will need to decide how we are going to proceed. Do we wait for our contractor, pick a new one, or just try to do it ourselves? Our kitchen may look a little crazy right now, but at least right it is operational (minus an oven). 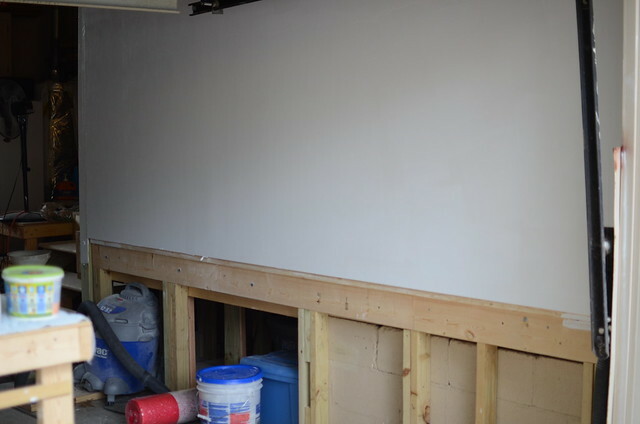 Mitch made some awesome progress on the laundry room. 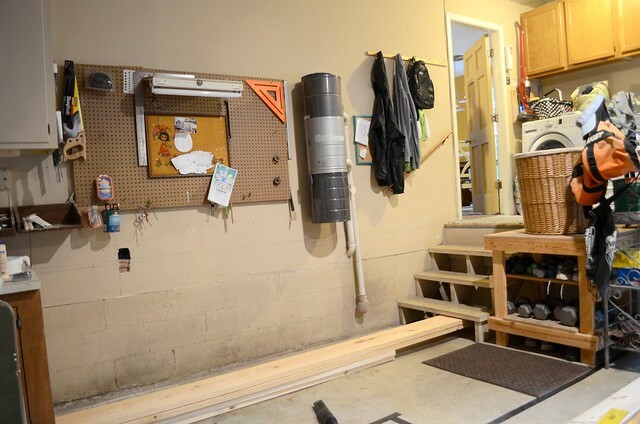 He drywalled, mudded, sanded, and mudded some more over Thanksgiving weekend. Then last weekend he sanded, primed, and painted everything. The next step will be to put the flooring down, put up trim, and shelves. Here's the other side of the wall. In case you forgot what our garage use to look like. It's pretty crazy. Here's a photo of our finished fireplace. Woohoo. We finished a project. Now we just need to get a chimney guy out to find out why it is leaking so that we can actually use it. I still find myself just sitting on the couch and staring at the fireplace. It makes the room look SO much better. It makes me happy to have at least one room that doesn't look like a construction zone. I am still trying to figure out how I want to decorate my mantel. Decorating is definitely not my strong suit. In case you forgot what it looked like before. Yikes. If the electrician actually shows up on Friday, I will have some new outlets to show next week. I will have another wool project up tomorrow. Where to begin?? I have missed you! First of all...that fireplace looks incredible. Seriously. Like a completely different room. I love it. Also LOVE the good progress on the laundry - go Mitch! I would totally vote for a built-in oven. I love that idea and look (and not having to move the pantry, etc...I think it will give you more storage and much easier access and ovens in the wall are just cool in my book. The eating area is a kind of problem...although I do LOVE that island...and, gah...I do like the gray in the island photo a little better. I'm sure that isn't what you want to hear, BUT I think you are already leaning toward re-painting, right? ;-) Incredible progress you two! Were I in this house, I would use a more vibrant colour on the wall behind the washer/dryer - purple is my first thought. But I don't know the other colours in your house. The area retains a complementing theme. At least it now looks coordinated. 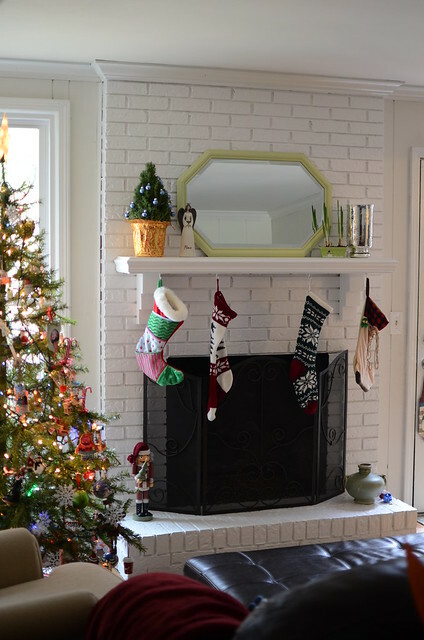 Wondering what type of paint/primer did you use for painting the fireplace? 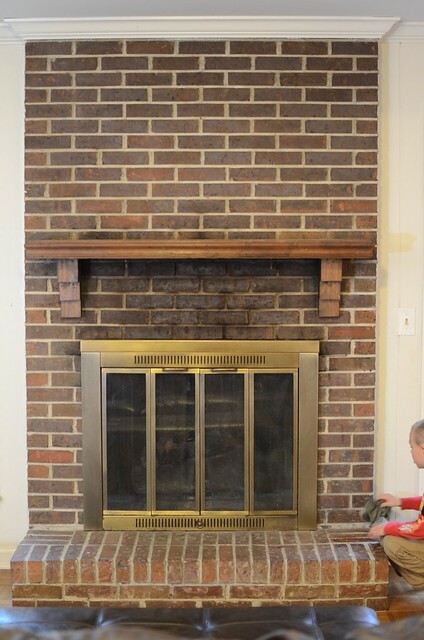 We have a real wood burning fireplace that we use and am looking into painting it! It's a huge step to take, so researching all my options! Thanks!